BENTON, Ky. (May 24, 2011) – Dave Mansue of Texas has been elected President of the Professional Anglers Association by the PAA Board of Directors. 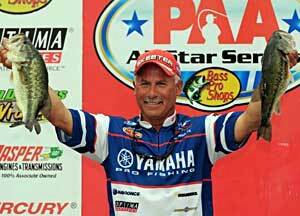 Mansue, 58, lives on Toledo Bend Reservoir and competes on the PAA Tournament Series and Bassmaster Open circuit. He moved there in 2009 with his wife, Andrea, upon his retirement as a lieutenant after a 30-year career with the West Windsor (N.J.) Police Department. Other officers elected for the 2011-12 term are Vice-President Kurt Dove of Texas, Treasurer Matt Reed of Texas and Secretary Brian Snowden of Missouri. Mansue, Reed and Snowden joined the PAA in March 2005 and Dove joined in December 2006. Mansue stays busy with some guiding on Toledo Bend “and a lot of home improvements,” as well as work related to the PAA. His hobbies include travel, hunting, fishing and cooking. He welcomed industry veteran and TV show host Charlie Ingram to the PAA Board of Directors and congratulated Dove, Reed and Snowden on being elected to their officer positions. Nominees from the membership are accepted each year for PAA Board of Directors positions and then voted on by PAA Tour members. Board members then nominate and vote on candidates for officers. Dove, Reed and Snowden have served on the board for the last two years. Mansue noted the PAA’s successes in the last year including growth of membership and sponsors, the success of the PAA Tournament Series and inaugural no-entry PAA All Star Series tournament held in April, and the continued association with the no-entry Toyota Texas Bass Classic held in October. “I have been a member of the PAA from the inception,” Mansue said. “I have always believed that to truly and significantly improve the lives of all our anglers and their families we must develop a system of tournaments in which we are no longer competing for our own entry fees. As a non-profit organization the PAA is in the best position to provide that opportunity. The PAA, despite our youthful status as an organization in this industry, has successfully provided such opportunities to our members with PAA All Star Series and TTBC events.